I am by no means an expert on art. I do, however, enjoy the idea that the right piece of art can really make you feel something—happiness, excitement, sadness, anger, melancholy…the list goes on—and if it does make you feel something, whether good or bad, that artist has done his or her job. The painting Irinaland über dem Balkan, or, “Irinaland over the Balkans,” by Austrian artist Friedensreich Hundertwasser, is one of those paintings. It’s complicated, how I feel about that painting: Above all, it’s a mindtrip—electric colors and wonderful, circus-like weirdness. It scares me. And yet, it comforts me. It’s one of those pieces that I could stare at for a really long time, trying to just figure it out. Thanks to Vienna jeweler Freywille, I sort of can. 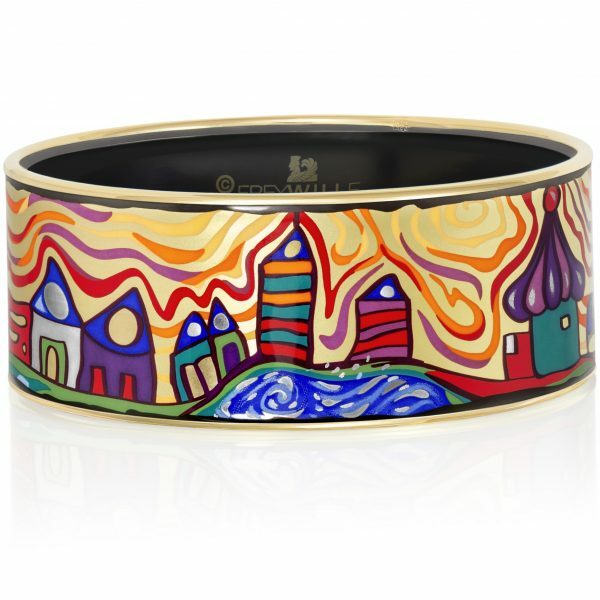 The painting has been reinterpreted in the brand’s Hommage à Hundertwasser series, mixing warmer colors into the already-passionate work of art, and using enamel to display it on pieces like this bangle bracelet. Plated in 24k gold and made colorful by fire enamel, the Donna bangle makes a statement without overwhelming, meaning it could pair with other bracelets—I’d try a few slimmer gold bangles to accompany it—and the jeweler also recommends stacking other bracelets from the same collection. This isn’t the only work of art that Freywille offers in its beautiful jewelry—but it does happen to be one of my favorites.